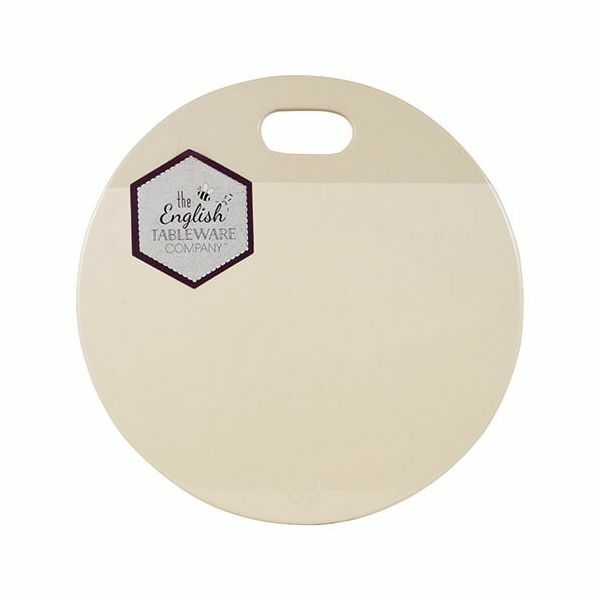 The Artisan Two Tone Cream Serving and Chopping Plate is made from durable ceramic and is ideal for food preparation. Suitable for chopping, slicing and also the plate can be used for serving cheese, meat and fruit. The two tone ceramic and cream gloss finish is attractive and hard wearing. The plate features an integrated handle which makes the plate easy to use. Part of this Artisan collection, this serving and chopping plate makes a great gift. Your delivery when and where you want it! FREE DELIVERY TO MAINLAND UK on all orders valued at £50 and over by DPD Courier on weekdays during normal working hours. £4.99 charge for all orders below £50 in value (delivery by DPD Courier) £2 charge for all orders below £25 in value (delivery by Royal Mail 3-7 working days). Excludes kitchen trolleys for delivery to Scottish Highlands. You will be notified by DPD on the morning of delivery with a one hour delivery window. You can also choose a preferred delivery day, up two weeks in advance, via our integrated check-out (Saturday, Sunday & AM deliveries charge extra). Alternatively you can choose to have your parcel delivered to your nearest DPD Click & Collect Pick-Up Point. If you are normally at work during the daytime, it is advisable to either have your order sent to your place of work or to a neighbour or friend who can sign the receipt for you. Alternatively, during the checkout process, advise us of a safe place where your order can be left. We pride ourselves on our rapid service and aim to have your order picked, packed and delivered within one working day via DPD Courier for orders placed on a weekday before midday, or 3-7 working days via Royal Mail. We will inform you if there may be a delay. Please inform us if this level of service is not upheld. Confirmation of receipt and acknowledgement of your order will be sent to you by email. Please note for orders being delivered to a different delivery address than the card holder’s registered address, there may be a 24 hour delay for further security checks. Unfortunately we are unable to deliver electrical goods, stoneware (such as china and porcelain) or glass items outside of the UK.